Dr. Geetha Srinivasan, Dr. John Foore, and the friendly Gentle Dentist team provide caring, state-of-the-art preventative, restorative and emergency dental services for patients of every age in the Collegeville and Trappe, PA area. We accept most major dental insurance including MetLife, Aetna, Delta Dental, Guardian, Cigna and United Concordia. We offer convenient appointment times including evenings to fit your schedule. We also provide emergency services after hours and on the weekend. When was the last time you visited the dentist? Regular dental checkups, periodontal cleaning, X-rays and fluoride treatments are important for overall dental health and can help to prevent cavities, gum disease and tooth decay. 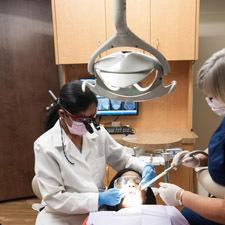 In addition to preventative dental care, The Gentle Dentist team offers fillings, bonding, sealants, crowns, dentures, dental implants, tooth extractions, root canals and fillings. We understand words like “fillings” and “root canals” can make you feel anxious – our team will put you at ease. Show off your smile! 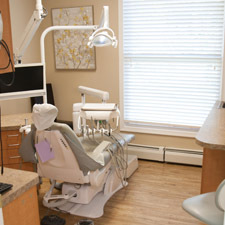 The Gentle Dentist of Collegeville and Trappe PA provides restorative dentistry including teeth whitening, veneers, dental implants and Invisalign® teeth straightening clear braces. Through comprehensive dental care services, we evaluate the best restorative solutions based on your dental health, lifestyle and budget. Children should visit the dentist regularly, years before the Tooth Fairy’s first visit. We recommend scheduling your child’s first dental visit before his or her first birthday, generally six months after the first baby tooth erupts. 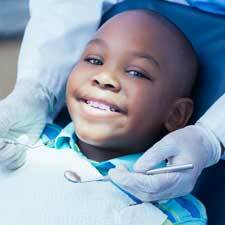 Frequent pediatric dentist visits are important in the prevention of early tooth decay. Regular visits to the Gentle Dentist also help to alleviate fear of the dentist. As parents, Dr. Srinivasan and Dr. Foore are especially experienced with childhood dental care and anxieties. We have a waiting room just for kids, and offer comprehensive care for pre-teens and teenagers as well. We provide sports mouth guards, nightguards and Invisalign® clear braces. 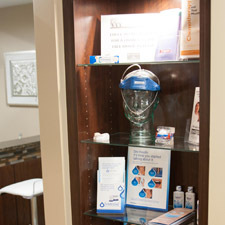 The Gentle Dentist Trappe and Collegeville, PA provides after hours and weekend emergency dental care. Dr. Srinivasan and Dr. Foore are on call and available for emergency office visits. Our office is equipped with state-of-the-art laser technology to deliver precise dental treatment, less need for anesthesia and faster recovery times. 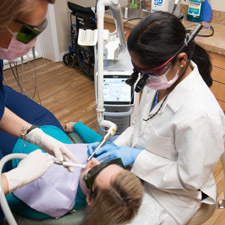 Dr. Srinivasan and Dr. Foore use laser dentistry including NightLase® to treat TMD, sleep apnea and benign oral tumors. 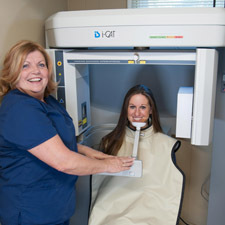 The Gentle Dentist of Trappe and Collegeville offers the latest advanced digital imaging technology, dental X-rays and iCat® imaging for clearer images and less radiation exposure. Our iCat® technology allows for faster, on-the-spot diagnostics and dental treatment plans. This 3D imaging gives precise images for dental implant treatments, impacted teeth, bone and jaw deformities, tumors, cysts, and more. We treat common conditions including sleep apnea, snoring and mouth breathing. If you feel very drowsy during the day, snore loudly or wake up breathless in the middle of the night, be sure to tell Dr Srinivasan or Dr. Foore. These could be symptoms of sleep apnea and require treatment. Snoring is common, but may indicate other health and dental concerns. The Gentle Dentist team will evaluate your symptoms and offer effective treatment plans. You may need a mandibular advancement device (MAD), a dental device that gently keeps the jaw in a forward position, helping you breathe better. If you suffer from chronic facial and neck pain, recurring headaches, pain in the jaw area or clicking or popping sounds with jaw movement, this discomfort could be caused by Temporomandibular Disorder (TMD) affecting the temporomandibular joints. We offer effective treatments for TMD. Teeth grinding, also known as Bruxism, can lead to headaches, damaged teeth and jaw disorders. Dr. Srinivasan and Dr. Foore will help you find the optimum treatment for teeth grinding and clenching. Dr. Geetha Srinivasan is among a select group of dentists certified by the state of Pennsylvania Board of Dentistry to administer Conscious IV dental sedation. This light sedation is ideal for patients who have fear of dental procedures or experience anxiety at the dentist. 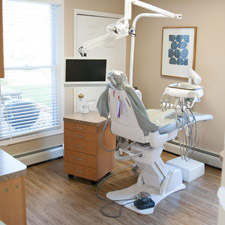 Learn more about Sedation Dentistry. The Gentle Dentist offers many dental implant options including same day implants and mini implants. With our comprehensive dental care, we are able to provide dental implant treatment in one location. Learn more about Dental Implants.